What Can I Sell For? What will my check amount be ? A home is more than just a collection of rooms and walls. A home is where you live, raise families, entertain, relax and feel safe. So much of your life is spent in your home, choosing the right one for you should be your number one priority. It is important to consider your priorities and the list of features you are looking for in a home. I’m happy to help you define the search parameters to locate the properties that best suits your needs and wants. Some things you may want to consider when creating your list are: price, location and your future needs. Everyone is different, and some of us may trade four bedrooms for a big kitchen! A larger backyard may make up for a longer commute to the office. The number of bathrooms may be more important to a growing family, or a single story home might be necessary for someone who has difficulty climbing stairs. I can help you narrow down the choices and find the property that best suits your needs. Based on your favorites I will set up several homes that we can go view. You may want to take notes the day of viewing, they all tend to run together after the 3rd one. After being shown the properties available to you based on your initial list of features, I will assist you with gathering further information so that you can make the right choice before you make any offers. “I can show you any home regardless of the company sign in the yard.” I am most happy to work for you! It could be the very first home you look at, or the very last one; but in either case, I will help you find that place you can call your “dream home”! One of the most important things in buying a home is the negotiation process and this is where Donna Cheek as a certified negotiation specialist can prove valuable.. Utilizing her experience as a skilled negotiator in the real estate industry, plus her vast knowledge of the market in the area is a win, win for you. The market has picked up and you need a Real Estate Agent that knows how to get the deal closed. 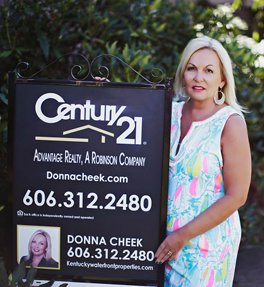 Donna Cheek will be available every step of the way. Step One: When you were approved for your loan did your lender say how much closing cost and prepaids (taxes & insurance) you needed. Also will you be paying these or do we need to negotiate these into your offer. Step Two: We write the offer for the property based on list price verses other sales in the area. The property will have to appraise for at least the sales price for your loan. Also taken into consideration is what monthly payment works best for you. Step Three: The offer is then sent over to the listing agent of the property to present to their seller. At this time they will either accept your offer of counter you back with what they are willing to sell for. You will have the option of accepting or countering back. If it is accepted by the seller. Then your offer becomes a binding contract and is ready to be sent to the lender. Step Four: Contract is sent to the Lender, at this point they will order appraisal and may ask you for additional paperwork, exp bank statements, tax returns, pay stubs. You will then want to order your home inspection and termite inspection if you are doing one. I highly recommend doing one. We have several good ones in the area we can recommend or you can look up online. Step Five: It normal takes 2 weeks from ordering appraisal until it is in. Once the appraisal comes back loan is sent to underwriting at the lender. If they need anything else they will request at this time. If not home usually comes out of underwriting about a week after appraisal is in. They will then ask you to contact an insurance company to acquire home insurance. If home inspection was satisfactory for you and you are ready to move forward, a closing date and time is scheduled. Step Six: Usually the day before or day of closing a walk-thru is done by you and your realtor of the home to make sure everything looks as expected. You will also want to contact the utility companies a day or two before closing to give them your information and deposits if needed and date to switch over. Step Seven: Closing Day you will arrive at your closing location and be sure and bring a photo id or drivers license, you will also need a certified check made out to the closing company or funds can be wired if you have any down payments due. The process usually takes less than an hour to sign all necessary paperwork. Congratulations! you are now a homeowner. If home was immediate possession you can begin moving in today. If not the possession time line was negotiated in your contract.